KNOW ALL MEN BY THESE PRESENTS, That we Tucker and Edward Moore are held and firmly bound unto this Patrick Thomas Esquire, Governor, &c. or his Successors in Office, in the full sum of Five Hundred Pounds, current Money, to be paid to the said Governor, his Successors or Assigns, for the which Payment well and truly to be made and done, we bind ourselves, our Heirs, Executors and Administrators, jointly and severally, firmly by these presents, sealed with our Seals, and dated this 11 day of July Anno Domini 1828. THE Condition of the above Obligation is such, that whereas the above bounden Churchwell Tucker hath made application for a License for Marriage to be celebrated between him and Rozannah McKiniy of the County aforesaid: Now, in case it shall not appear hereafter, that there is any lawful Cause or Impediment to obstruct the said Marriage, then the above obligation to be void; otherwise to remain in full force and virtue. I already had the date and location for this marriage, but I did not have a primary source document; thanks to @editor1130 (a Twitter friend!) for sending me this license. 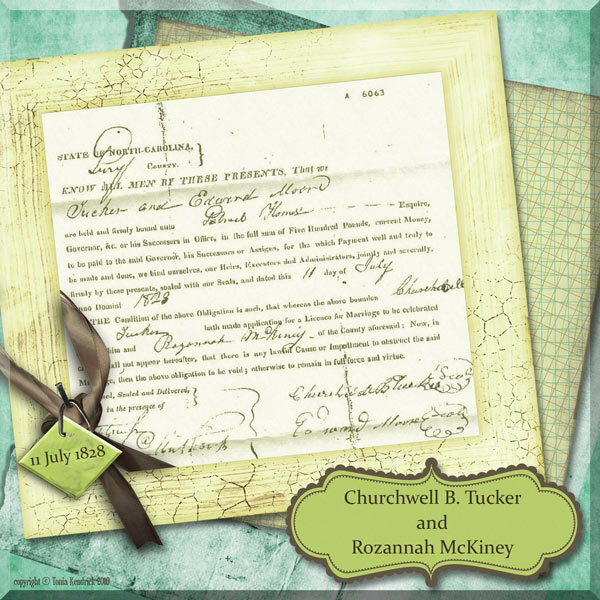 I had seen numerous references in online family trees to a “Rozannah McKinney” as the wife of Churchwell Tucker and I never knew where the name Rozannah originated. The name on the headstone adjacent to his is “Rosamond.” I’ve always thought Rozannah and Rosamond were close enough to be the same person, although I haven’t proved this yet. @editor1130 also sent me the marriage license for Churchwell’s parents, Branch Tucker and Lucy Blakey. I noticed that Edward Moore is the bondsman on both licenses. North Carolina still required marriage bonds at the time of both these marriages, so I need to look up the bonds in the Ancestry.com index to see if there is any more information that I can glean.